MORE than 300 guests helped to raise a whopping £16,500 in a Big Curry fundraiser for ABF The Soldiers’ Charity at Reading’s Hilton Hotel. 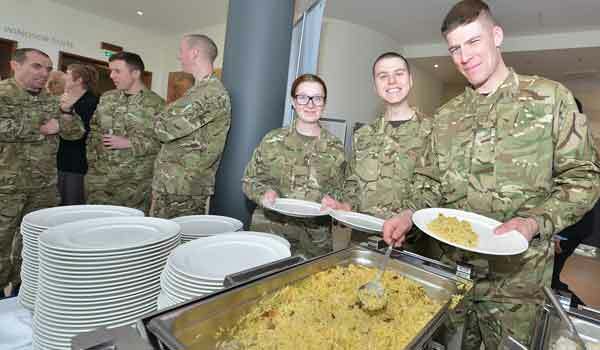 The annual curry lunch, organised by the Berkshire Committee of ABF The Soldiers’ Charity, not only gave guests a delicious dish, but also an insight into Army operations, with presentations from 145 (South) Brigade on support for our injured and wounded. If you would like to show your support, why not hold a Big Curry event in your Army community? Whether you decide on a beer and a Balti with friends or a gala curry night with your colleagues, becoming a Big Curry host is always fun and it’s a brilliant way to raise funds.